Previewed at: Verona Cinema, Paddington, Sydney, on 26 November 2017. In a world in which many young people are self-obsessed and focus mainly on their social media channels, taking selfies and sharing only information that makes them look good and their pedestrian lives idyllic, Stephen Chbosky’s Wonder is a wake-up call that should be compulsory viewing for kids. Certainly it is geared towards younger viewers because it presents an outcome that will be detected from the get-go by adults but would remain a guessing game for children and it covers issues that need to be addressed by developing youngsters. 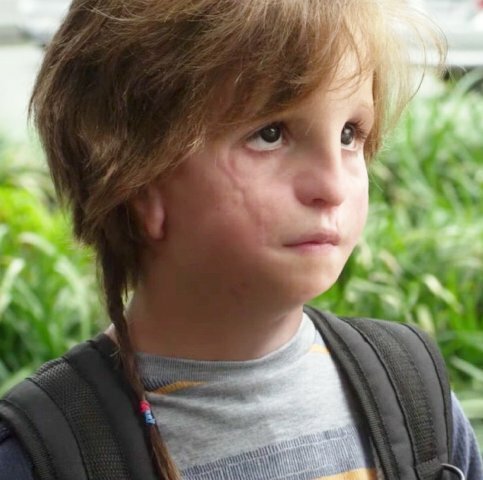 Set in upper Manhattan, the story focuses on the middle-class Pullman family, who are loving and attentive to their young son August, aka Auggie (Jacob Tremblay), who was born with a facial deformity known as Teacher Collins syndrome. He’s been home-schooled by his devoted mother Isabel (Julia Roberts) but now it’s time for him to enter middle school. His father Nate (Owen Wilson) is a constant source of encouragement and he is also supported by his teenage sister Via (Izabella Vidovic). On his orientation day at school, Auggie is shown the ropes by three fellow students and ends up being befriended by one, Jack (Noah Jupe), and bullied by another, Julian (Bryce Gheiser). Auggie has to live with the fact that most people will stare at him until they get used to his face and he has to develop the inner strength to cope with the trials and tribulations of being not only a new kid at school but one who stands out because he looks so different. He is fortunate in having an understanding teacher Mr. Brown (Daveed Diggs), who helps him find his feet, and a sympathetic school principal, Mr. Tushman (Mandy Patinkin), a straight-shooter who knows how to deal with the inevitable cruelty that occurs when kids are learning how to socialise with each other. Tremblay delivers a convincing performance and succeeds in maintaining a sense of dignity throughout (although his make-up isn’t completely hideous, despite reference to his appearance ‘making kids cry’). Fortunately, the script does not fall into a mawkish rendition of a disabled person who has to be pitied. On the contrary, you feel Auggie’s strength and even when it all gets on top of him, you know he will succeed. This predictability makes the film less interesting for adults but provides a good lesson for the demographic at which it’s aimed. Jack and Julian work well as ‘good cop, bad cop’, and Auggie’s adoring sister Via, who has her own troubles, is played with nuance by Vidovic. The only letdowns are the overreaction by Roberts, who stands at the school gate with such a look of misery on her face that you wish she would go home, and Wilson, whose over-earnestness gets to the point of being annoying. Overall though, Wonder accomplishes what it sets out to do and it’s just a pity that it wasn’t screened during the school holidays as it would have had a better chance at garnering the very audience who could learn something from such an up-lifting tale.